We are stockist of complete range of capacitors. - Radial - Vertical cylinder. Both the leads come out the bottom of the cylinder along the radius. - Axial- Horizontal cylinder. One lead end along the axis of the cylinder. - Disc - A Disc. Leads come out on the bottom, generally following the circumference of the disc. - Radial is typically electrolytic. Our reputed entity is engaged in supplying Radial Lead Capacitors. We are instrumental in offering our clients, quality Redial capacitor. These capacitors are ideal for light duty pulse, logic & timing circuits and lighting applications. Moreover, these capacitors are also used in high frequency circuits and electronic ballasts. 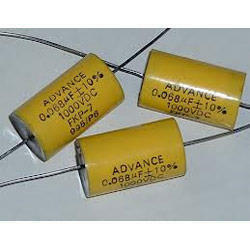 We are engaged in offering Radial Lead Capacitors. We are manufacturing wide range of radial lead capacitors - straight lead.